If you have been diagnosed with COPD, you can stop it getting worse. It won't ever go away completely but there are things you can do to stay well and to make your symptoms less severe. If you smoke you should stop smoking. This is by far the best way to reduce your symptoms and prevent your condition from getting any worse. If you are having difficulty stopping smoking, speak to your GP, practice nurse or pharmacist. You can also try some of the following options that don't involve medications. Canterbury Better Breathing programme is a free, community programme tailored to the needs of people with lung conditions like COPD. Try some of these Exercises you can do at home. Join a support group. 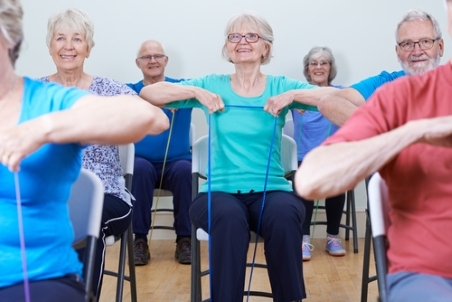 Many support groups run exercise programmes for people with lung conditions. Search Active Canterbury for activities in Canterbury. Browse by activity type, or phone 0800‑22‑84‑83 for more information. Christchurch City Council has sport and recreation centres and classes around Christchurch. Ask your general practice team about Green Prescription if you'd like more support with starting or continuing an activity programme. Keeping close to a normal weight (not too high, not too low) is good if you have COPD. Some people with COPD have difficulty putting weight back on, especially after infections. Your doctor will check your body mass index (BMI) and offer advice on whether you need to lose or gain weight. Exercise is a good way to stay a healthy weight by, as it builds up your muscles. It's important for your health to keep your home warm and dry. Keeping your home warm & dry has information about subsidies and support for heating and insulation. The Asthma Foundation has some useful information about keeping your home healthy. It is important to have an annual flu vaccination. Some people worry that they will get a chest infection or the flu from the flu vaccination. This is incorrect. If you have COPD, you are more likely to be seriously affected by catching the flu or getting a chest infection after having the flu. People with COPD are often given inhalers. Inhalers are devices that deliver medication to your lungs. The Inhalers page has a link to a poster showing the inhalers that are available in New Zealand. It is important to use your inhalers correctly for them to work. See Inhalers for information about how to use an inhaler. Most inhalers for COPD open up your breathing tubes and reduce your breathlessness. There are many different inhalers that last for different lengths of time. Your doctor will usually give you a short-acting reliever such as salbutamol (Ventolin). You should use this if you are breathless or about to do something that will make you breathless. Your doctor may also give you longer acting inhalers to use once or twice a day to keep your breathing tubes open. Some people who have frequent flare-ups (exacerbations) may be given an inhaled preventer containing a low dose of a steroid such as fluticasone (Flixotide). But most people with COPD don't need this. If you have a flare-up, you will normally be given antibiotics and sometimes steroid tablets (prednisone). If your sputum (phlegm) has changed colour, you are producing more than usual, and you are getting more breathless, antibiotics will help. Your GP may give you a stock of antibiotics to keep at home. You should use them according to your agreed COPD Management Plan (COPD Blue Card). Starting antibiotics early can stop a flare-up getting worse. It can also reduce the time it takes to recover. These medications are called mucolytics. They help make your phlegm easier to cough up. An example of a mucolytic is a syrup called bromhexine hydrochloride (Bisolvon), which you drink. Many people think that oxygen is a treatment for breathlessness. But this is incorrect. People get breathless because of the difficulty getting air in and out of lungs that are stiff with narrow breathing tubes. Giving extra oxygen doesn't help. But some people have low oxygen levels all the time. These people are given oxygen to protect their hearts from the long-term effects of low oxygen. If you have very severe COPD, you may be referred to see a chest specialist. There are operations and procedures that may help a small number of people who have very severe COPD but are otherwise well. This includes lung transplants. Some people in hospital with a severe flare-up of COPD are treated for a short time with breathing support using a mask. If their oxygen level is very low, they will also be given oxygen.